Event-triggering formation control with multiple leaders in second-order nonlinear multi-agent systems is investigated in this paper. 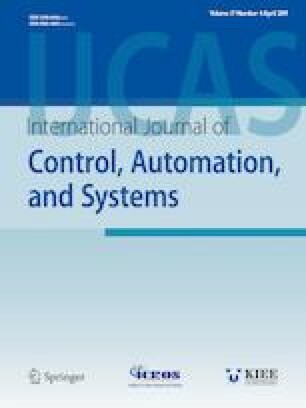 This novel distributed formation control strategy allows the event-triggering condition to be intermittently examined at sampling instants, where the data transmission is driven by an event-triggering control protocol. Based on this strategy, two different formation control protocols are presented. Then, some sufficient conditions are given to ensure the second-order nonlinear multi-agent systems converge to the desired formation shape. Finally, examples are given to show the effectiveness of theoretical results. Event-triggering protocol formation control multi-agent systems nonlinear dynamics. Recommended by Associate Editor Yang Tang under the direction of Editor Hyun-Seok Yang. This research was supported by by the Innovation Program of Shanghai Municipal Education Commission (13ZZ050), Scientific Research Plan Projects of Shannxi Education Department (17JK0709), the Natural Science Foundation of China (Grant 61703003), the Natural Science Foundation of Anhui Province (Grant 1708085QA16). Jing Liu received her B.S. degree in fundamental mathematics from Fuyang Normal College, Anhui, China, in 2004, and her M.S. degree in fundamental mathematics from Chongqing University, Chongqing, China, in 2007. She is currently pursuing a Ph.D. degree in in Control Science and Engineering from Donghua University, Shanghai, China. Her research interests include multi-agent systems and distributed control systems. Jian-an Fang has been a Professor with Donghua University, since 2001. He joined the College of Information Science and Technology, Donghua University. In 1998 and 1998, he was a Visiting Scholar with the University of Michigan, Ann Arbor, MI, USA. From 1998 to 1999, he was a Visiting Scholar with the University of Maryland, College Park, MD, USA. From February 2005 to 2005, he was the Senior Visiting Scholar with the University of Southern California, Los Angeles, CA, USA. Prof. Fang was a Council Member of the Shanghai Automation Association and the Shanghai Microcomputer Applications in 2005 and 2006. Guang He received his M.S. degree in computational mathematics from Harbin Institute of Technology, Heilongjiang China, and his Ph.D. degree in electrical engineering at Donghua University, Shanghai, China, in 2006 and 2016, respectively. He has been an Associate Professor with Anhui Polytechnic University, Anhui, China, since 2017. He is currently a research Associate with The Potsdam Institute for Climate Impact Research, German. His current research interests include switched systems, opinion dynamic and consensus. Publisher’s Note Springer Nature remains neutral with regard to jurisdictional claims in published maps and institutional affiliations.